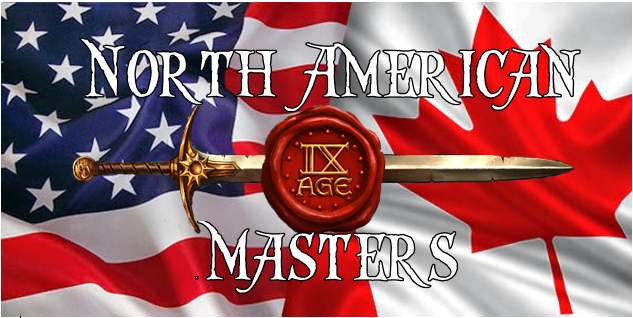 Where: The 1st ever 9th Age North American Masters Event will be held at Gamer’s Haven, 275 Schuylkill Rd, Phoenixville, PA 19460. Really nice gaming store with comfortable computer chairs and a in store grill. They even allow BYOB! When: The event will be held the weekend of January 18-20 2019. Qualifying: The goal in mind is to have The Masters event be a 32 man event where people have to qualify in order to get into, not just anyone can walk in and be The Master. There will be 3 different ways to qualify to make it obtainable for everyone. Winning Select GTs – There will be 16 invitations awarded by winning/doing well at GTs. There are 14 GTs selected that the winner will be invited to attend The Masters (list of these will come out soon). In the case that the winner declines it will go to the next person in line. If he/she declines, next person, so on and so forth all the way down the 10% of the events attendance (i.e. if a 40man event we go down to 4th place for invitation). If none of these accept then the invitation will be thrown into the pool for people to obtain during the qualifier event the Friday of The Masters. Rankings – Another 8 invitations will be given out to the top 8 people according to Warscore Rankings that have not already accepted an invitation from winning a GT. All events that submit their results through Warscore will count towards rankings. There is a formula in place for this to weigh events so that bigger events count for more points, but even 1 day events will count for some points (although at a lower scale). It takes the top 3 events and calculates points to get your ranking, so obviously the more events you go to the better chances. Friday Qualifier – here will be an open play event on the Friday of The Masters. The top “X” spots at this event will then receive invitations to play in The Masters GT for Saturday and Sunday, where “X” is equal to the amount needed to fulfil the 32 man event after GT/Warscore invitations. Invitations – invitations will be sent out the week of December 1st for GT winners and the week after om December 8th for Warscore rankings. In the case that one person wins more than 1 GT that’s a qualifier, their invite will be used for their first win. The event they won their 2nd or 3rd event will have it sent automatically to person who came in 2nd. In the case a individual declines an invite from winning a GT they then decline their Masters invite all together and won’t then be able to accept 1 through rankings or the Friday qualifier. Painting – Painting at The Masters will be required to be a 3 color minimum and based. There will be no “judging” of paint. Simply you meet this per-requisite or you don’t. If not you will receive a penalty. This is the championship event of a hobby and participants are expected to uphold a certain standard for the hobby.